So I have about 2 more weeks of summer before my 3L year of Law School. I do not know where time has gone- it flew by! I had a reader request this post and I think it is a great one. 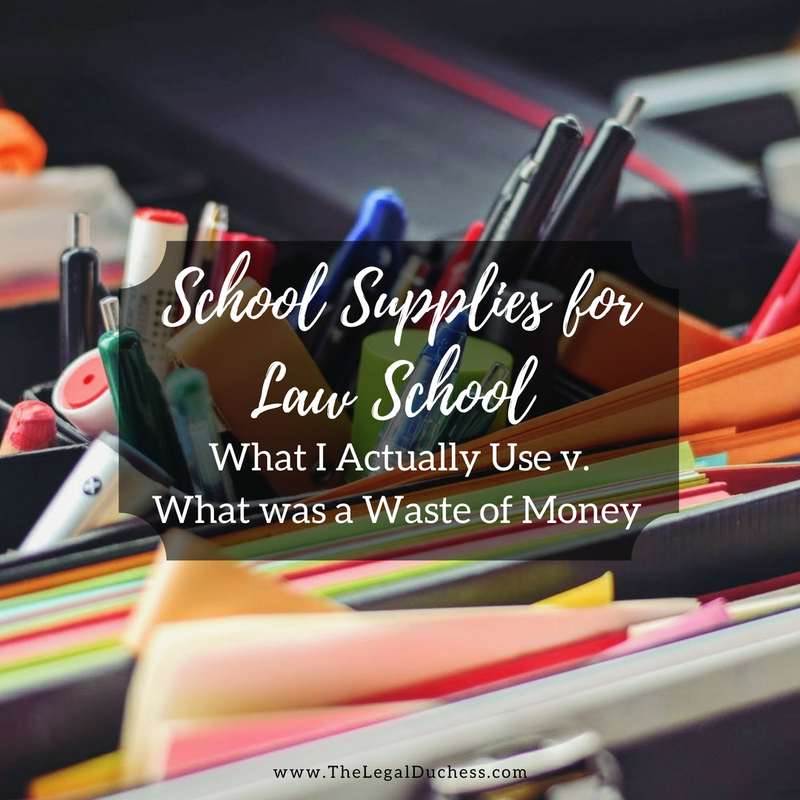 I will be talking all about the supplies I use in law school and compare/contrast what I bought for my 1L year and all the things that were a waste of money because I never ended up using them. I have always LOVED school supplies shopping. I would beg my mom to take me shopping for new school supplies at the beginning of August so I would have a few weeks to completely organize and decorate my binders and notebooks. College didn't change anything except now I had to buy my own school supplies. When I was getting ready to start law school, I was so pumped to get all new fancy school supplies. A lot of those things I bought 1L year, I still use... but a lot of things I never really used and ended up being a waste of money. So today I am laying out all the things I truly use in law school for the last 2 years and all the things that were a waste of money. Below I will list what I actually use and what other things I have added to my list of "must have's". I have a nice small Dell computer. I don't know it's exact details (it was a gift) but it is perfect for hauling to classes (I linked the most similar looking one). It is light and easy to use. I highly recommend a small, light computer if you plan to take notes in class electronically. For times I am not using my bookbag with its laptop compartment, I have a nice little carrying case for it with little compartments for my mouse, power cord, etc. I have a Jansport backpack made for carrying Laptops and mass amounts of books (mine came from TJ Maxx but I linked something similar). It has lasted me all the way through law school so far and I love it. It's not pretty but it is functional and holds up to the law school grind. I also have a simple leather tote for internships, interviews, etc. This is the exact pencil bag I have. I keep it in my bookbag filled to the brim with a million pens, pencils, white out, and tabs. It goes on my desk in every class. I mostly use Pilot G2 pens for taking notes but I also love the Uniball Gel Pens. Mostly I just write in a variety of bright colors for everything and my notes are like a rainbow. I keep a few mechanical pencils in my bag just for exam scantrons. There is so much paper in law school and loose paper drive me crazy so staplers are important. I keep a big stapler at home and a mini one in my backpack for last minute things. Remember when I said there's lots of paper in law school? Well 3 hole punching and putting it all in binders is one of the best ways to stay organized. Invest in one of these! We just talked about binders.... I have binders for every class, exam outlines, one per research paper... it's best to just stock up on these binders! I take almost all of my notes by hand so I have a notebook for each class. I prefer these nice heavy duty ones with college ruled paper. Sometimes I take notes on loose-leaf paper and put it into the assigned binder. The reinforced paper is by far the best!!! I have an iPad that was a free promotional gift from when we signed up for our home internet. I love to prop this up on my desk in this handy little case with Pandora music playing or Netflix for when I need a little background noise for my studying. I also sometimes put my notes up on it so I can type them into my outline without flipping back and forth between screens on my computer. This is a big investment and not necessary but it is nice to have for certain things. Noise canceling headphones are a life saver for me in law school. I use them when studying at home to block out my husband's video games or ESPN blaring in the living room and I use them at school to block out the bustle of the law school. They make me so much more focused. I have talked about my love for my Plum Paper Planner on here a million times but I seriously do love it and couldn't do law school without it. Send me an email if you would like $10 off your very own Plum Paper Planner. I also love these little weekly planning pads- I use it as a mouse pad and it keeps my weekly commitments at my fingertips. I love me some good sticky notes and sticky tabs. I use them like it's my job. I have a whole stockpile in my desk of them! I take all my notes in pen so white out is a necessity for all the little mistakes. This little roller white out pens are the best. Law school makes me spend wayyyyy too much time sitting in a desk chair. I have a bad back so I end up in a lot of pain as a result. This little desk chair cushion helps SO much- it is made to help your sitting posture and align your spine. Lifesaver in my opinion! My mom got me one of these for Christmas last year and at first I was not pumped about it. I finally decided to give it a try and I really like it for long study sessions. I like the peppermint and grapefruit oils. I exclusively use gel highlighters for law school because they DO NOT BLEED. I am obsessed with this set. I keep a power bank in my bookbag for those days when my phone battery just won't last or when my friends forget their charger. These things come in handy all the time. I use this all the time at home. I prop my books up one it, my binders while outlining.... it seriously comes in handy all. the time. And for $10, why not? For classes that I do not use a binder, I keep a little folder like this to put all the handouts and random papers and keep things organized. When I am studying or writing at home, I love having a wireless mouse. It makes everything so much easier! I keep a printer at home because sometimes I just need something printed right now and can't wait until I get to school the next day. I love having this little calendar hanging above my desk for a quick overview of the month. I put big deadlines, assignments, events, and commitments on here so I have an idea of what is upcoming. Not to mention, its very pretty! I have talked many times on my blog about my obsession with making lists and these little list pads are the best for it! I keep one on my fridge, one next to the couch and one on my desk at all times. I love to have pretty things... but sometimes that isn't the most practical. I bought a bunch of "pretty" desk accessories at the beginning of law school and most of it didn't even make it through the first year without breaking. Now, I invest in higher quality items that aren't quite so pretty so that they will last. I got super excited about being organized for 1L year and bought a label maker.... I used it for the first semester and then it got buried in my desk drawer and I haven't used it since. In hindsight, this was a waste of money. As I stated before, I use gel highlighters for everything. I bought the liquid ones 1L year and still have them just sitting in my jar of pens on my desk but I barely use them. In hindsight, I should have just got the gel ones and not wasted money on liquid. I bought a little corkboard for above my desk before starting law school. I pretty much never use it. Sometimes I remember it's there and add something to is but mostly I forget it exists. In hindsight, could have saved money and not bought it. I hope this is helpful to all of you getting ready for law school! Hi there! How did you decide which classes to use a binder for versus just a folder? Do you just kind of have to feel it out as you go based on paper volume? The links to the items seem broken. Hi do you still have a promo code for plum paper planners? Yes. Please send me an email through the contact form and I will send your referral code to you.